Restoration of the natural and ecological balance in water ecosystems of the rivers of Ukraine, creation of the conditions for environmentally safe water use are possible only on the basis of determining their actual ecological status, which will enable to implement water management and ecological zoning of the territory of the country, to develop engineering and organizational principles for solving the problems existing in the river basins. The purpose of the research is to calculate human pressures and classify the ecological status of the basins of small rivers in Rivne region. 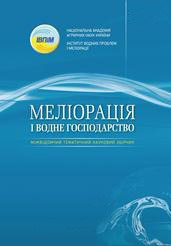 The calculation of human pressures and evaluation of their impact on the ecological systems of the rivers in Rivne region is performed on the basis of the classification (assessment) of the state of basic natural systems (subsystems) — land and water resources, water quality by chemical, toxicological, bacteriological and radiation contamination. This can be done using an ecosystem approach based on a logical-mathematical model of a hierarchical structure, which makes it possible to assess the status of river basins in general and within individual subsystems. It also gives an opportunity to evaluate the effect of changes in some indicators on the state of subsystems and basin ecosystems as a whole. There is no a small river that would have a «good» ecological status. It can be observed some small changes in 50% of the considered rivers, 10% of them can be considered as those which have satisfactory state, but 40% of them are characterized by bad and very bad state. The states of the basins of the Veselukha, Stubla, Vilya, Virka, Lions Rivers are characterized by minor changes, the Ikva River has a satisfactory state and the Slonivka, Ustya, Zamchysko and Korchik Rivers are in bad and very bad conditions. Summing up the evaluation of human pressures on the small river basins in Rivne region, it can be stated that the general conditions of the basins are generally satisfactory. This is confirmed by the results of previous studies on the calculation of human pressures and classification of the ecological states of small river basins performed by such scientists as A.Yatsyk, P.Kovalchuk, A.Chernyavska and M.Budz, which are given in “Anthropogenic factor in the formation of the hydrological regime of small rivers of Western Polissya of Ukraine”. Despite the complexity of the issue of rationing the human pressures on the river basins, using a logic-mathematical model «Small River Basin» it is possible to gradually approximate the values of pressure for each river, which can provide keeping self-cleaning ability of its ecosystems. 1. Yacyk A.V., Petruk A.M., Kanash A.P. Metodychne kerіvnyctvo po rozrahunku antropogennogo navantazhennya і klasyfіkacіyi ekologіchnogo stanu baseynіv malyh rіchok Ukrayiny. Kyyiv: UNDІVEP, 1992. 40 s.
2. Yacyk A. V. Vodogospodarska ekologіya: u 4 t., 7 kn. Kyyiv: Geneza, T. 3, kn. 5. 2004. 496 s.
3. Budz M. D. Antropogennyy faktor v formuvannі gіdrologіchnogo rezhymu malyh rіchok Zahіdnogo Polіssya Ukrayiny. // Ukrayinskyy derzhavnyy unіversytet vodnogo gospodarstva ta pryrodokorystuvannya. Vіsnyk UDUVGP. Zb. nauk. prac. Vyp. 5(18). Ch.5. Gіdrotehnіchnі sporudy, gіdravlіka. Gіdrologіya ta gіdroenergetyka. Rіvne: 2002. S. 10-16. 4. Gopchak І.V. Analіz antropogennogo navantazhennya na baseyny malyh rіchok Ukrayinskogo Polіssya. // Geodezіya. Zemleustrіy. pryrodokorystuvannya: prysvyachuyetsya pam’yatі P.G. Chernyagy: Zb. tez Vseukrayinskoyi naukovo-praktychnoyi konferencіyi (m. Rіvne, 9-10 lystopada 2016 r.). Rіvne: NUVGP, 2016. S 119-121. 5. Palamarchuk M. M., Zakorchevna N. B. Vodnyy fond Ukrayiny: Dovіdkovyy posіbnyk. Kyyiv: Nіka-Centr, 2001. 392 s.
6. Naukovі zasady normuvannya antropogennogo navantazhennya rіchkovyh baseynіv. / Yacyk A.V. ta іn. // Zbіrka dopovіdey Mіzhnarodnogo Kongresu "ETEVK-2015" (Ukrayina, m. Іllіchіvsk, 8-12 chervnya 2015 r.). Kyyiv: TOV "PRAYM-PRІNT". S. 314-322.